With the grow of online shopping, there’s been a significant spike in package thefts. According to a 2015 report, 23 million Americans reported having a package stolen from their doorstep. This has become such a widespread problem there’s now a name for these criminals, porch pirates. The holiday season has arrived, and there are already reports of porch pirates striking unsuspecting neighborhoods. As a property management company, it’s critical that you’re doing what you can to help prevent porch pirates from stealing the holiday spirit in your communities. Be sure to share these five tips with your community to help reduce stolen packages. Sure, having a package delivered straight to your doorstep is the most convenient option. However, unless someone is home to sign for it, you’re taking a risk. 35% of consumers report having a package sent to an address other than their home to prevent theft. Encourage residents to ship expensive packages to their office for guarantee delivery. Another option would be asking a neighbor who is home during the day to either pick up the package, or have it delivered directly to their house. If your community has an occupied front desk or club house, encourage residents to send their packages there. With convenient package tracking features in FRONTSTEPS, you can accept packages and ensure the rightful owner picks them up every time. Companies like Amazon and FedEx understand the pain porch pirates cause, and as a result, have started offering services to combat stolen packages. With FedEx, you can choose to have your package delivered directly to a FedEx location for pickup. You can also sign up for their free Delivery Manager service which helps you customize home deliveries. Amazon, on the other hand, now offers in-home and in-car delivery, as well as Amazon Lockers that enable customers to safely and conveniently receive and return packages. 42% of consumers report having an area not visible to the public where delivery companies can leave packages. Both Amazon and FedEx offer delivery notes where you can specify where you’d like your packages left. Consider having non-fragile deliveries left in your backyard or a fenced area. If you have a hidden spot on your front porch, provide the exact location that drivers should leave the package. Ring and Nest doorbells are a great way to provide peace of mind and combat porch pirates. The doorbell begins recording as soon as it detects motion. If porch pirates are hauling off valuable packages, you can be sure the doorbell will record the entire thing. These videos can then be submitted to local law enforcement to help with the investigation. Does your community have security software in place to monitor who’s coming in and out of the neighborhood? If so, take advantage of that forensic data to aid authorities in their investigations. 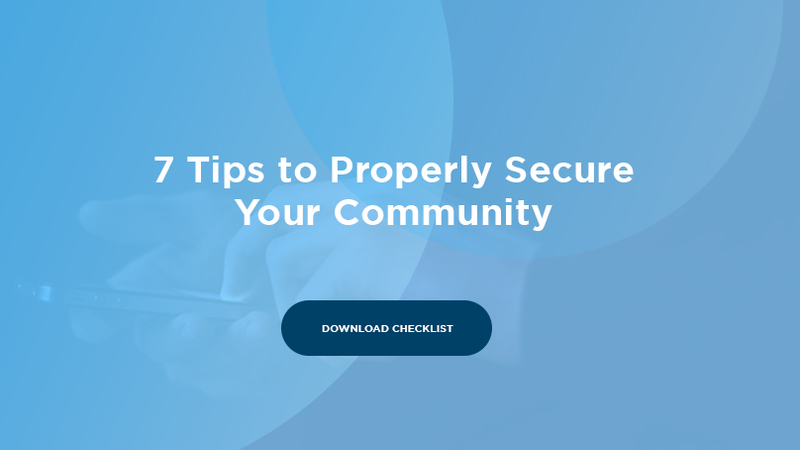 For additional tips on keeping your community safe, download your copy of our 7 Step Checklist for Securing Your Communities.